After the release of her debut album Wishing Tree, Little Sparrow has released her new EP featuring two new songs, her first material since the album came out. We had a listen and loved the different mood created by the new material. Little Sparrow's (aka Katie Ware) debut album Wishing Tree was one of our favourites of the year and she has followed up the releases of the title track and Polly earlier in the year with our standout track on the record Struck Gold as an EP with two completely new songs. The real beauty of Little Sparrow's music is in how her angelic operatically-trained voice combines with acoustic guitars and strings to produce something that will appeal to a wide range of people. 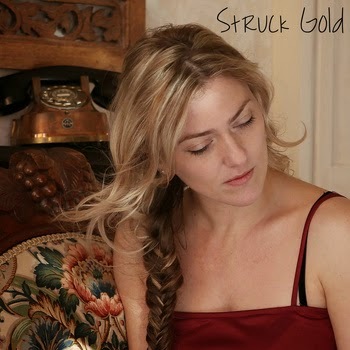 Struck Gold has all those qualities from the plucked strings and Katie's vocal harmonies in the opening section and first verse and the lyrics about love - "I'm bound to you with threaded twine, I can't believe you are mine" and "I wouldn't change you for the world, you're the piece of me that struck gold" - as the song builds to the chorus. The two additional tracks on the album move away from the more accessible poppier side of Little Sparrow that has got her radio play to produce something yearning and beautiful. Whilst a debut album has a lifetime to be written, follow-up tracks tend to have a short gestation period and often reflect a change in style. Memories Maid has a soft acoustic / strings backing, gentle and understated, whilst Katie's vocals take centre stage, demonstrating how much she can use that voice to dictate pace and emotion of a song, the middle eight focused around her harmonies over a solitary string accompaniment. That more melancholy reflective mood is continued If I Were A Bird and is a love song using analogies of birds and trees they nest in to. The lyrics include "you can always count on me, I'll be waiting here for you. There's many people in this world, but there's none come close to you", set to an understated reflective string-laced tune. The Wishing Tree album should be your first port of call to listen to and fall in love with Katie's voice, but this EP and the two extra songs are the icing on the cake for a great year for Little Sparrow.